GALION — With Halloween in the rearview mirror and Thanksgiving still a couple weeks in the future, Galion-area residents are already gearing for the December holiday season. And that means plans are coming together for this community’s Come Home to Galion celebration. Co-chairs for the event this year are Miranda Jones and Sarah Capretta who are hard at work making certain every aspect of the event goes off without a hitch. This year’s celebration is Saturday, Dec. 1. The first event of the day will be Breakfast with Santa at the Big Four Depot Pavillion. There will be three sessions available to attend at 8:30 a.m., 9:45 a.m., and 11:00 a.m. Cost is $5 per person for anyone who attends and includes breakfast. as well as a photo with Santa. Only 150 tickets are available for the event and are available for purchase in advance online at the Come Home to Galion website or by calling 567-393-6446. Breakfast with Santa is being sponsored this year by Avita Health System. The Reindeer Dash was a new event last year, that is not only returning for 2018, but will be doubling in size. The event is also moving to take place at 1 p.m. as a kickoff to all of the events planned for the uptown area that afternoon. This year the Reindeer Dash will be open to 120 participants vs. just 60 just last year. This fun holiday-themed relay race is open to teams of two or four individuals and is held uptown, outside the office of the Galion-Crestline Chamber of Commerce on Harding Way West. Registration is $10 each and includes a Reindeer Dash t-shirt. A hoodie sweatshirt is available this year as an option for an additional $10. Registration is needed by Nov. 12 to be guaranteed a shirt in time for the event. Tickets are also available online for the Reindeer Dash or by calling 567-393-6446. Cake and Icing, 114 Harding Way West, will be offering free cookie decorating from 1 to 4 p.m.. Each child will be given one cut out cookie to decorate free of charge. Children will also be able to write and drop off letters to Santa at the Central Hotel on the public square. Brush and Palette Art Gallery will be once again offering their Elf Hunt for children from 1 to 4 p.m..
A window decorating contest will be held for businesses to spruce up their appearance for the holiday season, and the public will be voting on a winner during the uptown events on December 1. A map of participating businesses will be available at the Chamber office. Another new addition to Come Home to Galion will be business and organization banners available for purchase that will be hung up in place of the veterans banners. The popular Veterans banners will come down after Veterans Day on November 11, and the new banners will be hung in their place alongside the city of Galion Christmas decorations for the holiday season. The cost of the each banner is $40, and they will be reused next holiday season. Galion Public Library will once again be offering carriage rides from 1-4 p.m. that will run between the library and Brownella Cottage. Galion Historical Society will have Brownella Cottage open from 1-4 p.m. also for tours free of charge. Gospel Baptist Church will have its annual live nativity on the lawn of the former Galion Middle School site on South Union Street. The Come Home to Galion parade will step off from the tennis courts in Heise Park at 4:15. 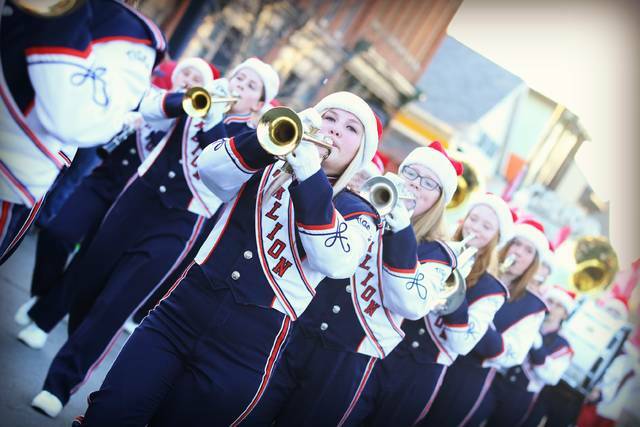 The parade route will be extended this year to once again include Jefferson St., onto Harding Way, and conclude on Columbus St. Any business or organization interested in entering the parade is requested to turn in their parade application by Nov. 24. Tree Lighting will take place at approximately 5:30 at the conclusion of the parade and a short holiday ceremony by local churches. The day will conclude with the annual Polar Express trolley rides beginning at 5 p.m. and movie showing at 7:30 p.m. at Galion Community Theatre. Trolley rides will go between the Galion Community Theatre and the Big Four Depot Pavilion. Tickets for this event are $5 and the event is sponsored by My Floors of Galion. Anyone wishing to donate to the Come Home to Galion event may do so by check made out to the Galion Community Foundation. Donations can be mailed to 138 Harding Way West. All tickets available in advance by visiting Comehometogalionohio.com or by calling 567-393-6446.